Home / Retirement / 401k & Investing Tips / If Netflix Stock Drops, Don’t Be Afraid to Pull the Trigger! If Netflix Stock Drops, Don’t Be Afraid to Pull the Trigger! Netflix, Inc. (NASDAQ:NFLX) has enjoyed dramatic growth over the last few years, and it’s not hard to see why. Streaming services are rapidly replacing traditional media outlets, offering significantly cheaper entertainment. Furthermore, the quality of original content keeps improving, making Netflix stock an enticing opportunity. But what makes the current juncture particularly interesting for investors is the streaming giant’s resilience. While much of the market worries about possible trade war between the U.S. and China, NFLX stock has remained above the fray. In fact, on a year-to-date basis, NFLX is up a whopping 50%. I had to triple-check the numbers to make sure I wasn’t seeing things. More importantly, the company is performing exceptionally well against the competition. Amazon.com, Inc. (NASDAQ:AMZN) is up 20%, while Alphabet Inc (NASDAQ:GOOGL) and Apple Inc. (NASDAQ:AAPL) are so far disappointing. Sometimes, an organization is so strong that you simply must set aside cautionary indicators, such as rich valuations. I believe Netflix stock is one of these examples. However, I want to urge some caution. I agree wholeheartedly with my InvestorPlace colleagues Nicolas Chahine and Tim Biggam, who advise options strategies to reduce long-side risk. Nevertheless, they’re generally positive on NFLX stock. My contribution to their analyses is to caution against a potential bearish head-and-shoulders in progress. The recent spike high above $330 may represent the head, while the January closing high of $284 might be the first shoulder. If I’m correct, we could see another crack above $300 before Netflix stock falters. And when it does, it could fall below $230. Should that occur, don’t hesitate to pull the trigger. Naturally, one of the questions that’s posed about Netflix stock is whether it can maintain its momentum. What goes up must come down, especially when the broader markets are so worrisome. I’ve been bullish on NFLX stock for quite some time, and I’m not about to stop. This isn’t based on pride or the desire to stay consistent with my logic. But rather, I genuinely believe that Netflix can continue to deliver the goods, despite its run-up. One of the company’s most impressive attributes is its worldwide subscriber growth rate. 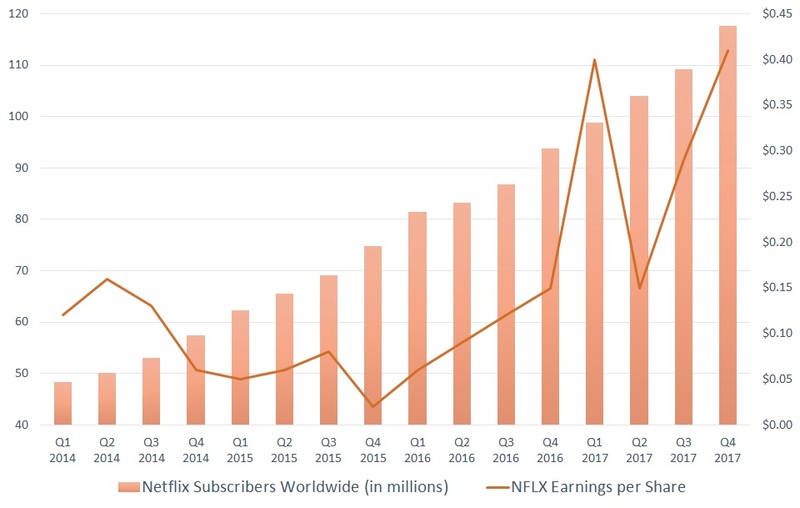 In the second quarter of last year, NFLX hit over 100 paid subs for the first time. Since then, its averaged 6% subscriber growth. Moreover, Netflix’s earnings per share took a dramatic turn northward beginning in Q4 2016. That was when EPS hit 15 cents, producing an earnings surprise of nearly 14%. More impressively, it exceeded the year-ago quarter’s EPS by a massive 650% margin. From Q4 2016 onwards, year-over-year EPS growth averaged 320%. This is an astounding accomplishment when you compare Q1 2015 through Q3 2016, which averaged -15%. On the other side of the equation, sequential quarter-to-quarter sub growth in the last five quarters averaged 6.3%. Since Q2 2014, average sub growth is 6.1%. These statistics tell me one important thing: management’s investments towards growing its subscriber volume is both a competitive disruption and a profitable venture. If anything, it sends a powerful message to potential rivals that Netflix won’t give up market share cheaply. In the meantime, they’ll rack up the earnings. So yes, Netflix stock can most definitely sustain its remarkable momentum. Now, my listing out the longer-term fundamentals for NFLX stock doesn’t mean you should just jump on it immediately. Like I said, I think shares are forming a bearish head-and-shoulders pattern. Plus, I have more confident in this argument because of what’s going on in the broader markets. That said, if you’re going to take a shot on a hot growth stock, NFLX is it. Traditional media has its role for old-school guys like me. However, I recently purchased a smart TV and I’m increasingly seeing why so many folks are cutting the cord. Essentially, Netflix is just a quicker, easier and cheaper way to do TV. As overplayed as this argument is, it’s still extremely valid. Bottom line: Netflix stock will likely suffer at least some volatility. Just be smart about your entry points, and enjoy the discount. Once the corrective phase is over, NFLX will resume its regularly scheduled programming. Article printed from InvestorPlace Media, https://investorplace.com/2018/04/netflix-stock-drops-dont-afraid-pull-trigger/.